Where are the Best Day Hikes in the Sawtooth Mountains? The Sawtooth Mountains are home to miles of trails, each more scenic than the one before. Mountain peaks touch the clouds, trees stretch to the sky, and the clear lakes reflect the landscape. When you stay at Triangle C Cabins, you’ll have access to countless paths that wind up and down the mountainside. So, where are the best day hikes in the Sawtooth Mountains? Here are a few of our favorites. Adventurers flock to the Sawtooth Mountains for countless reasons. If you’re planning on coming to our area, take a look at our Adventure Guide. As locals in the area, we put together a list of useful information so you can have the trip of a lifetime. Whether you are looking for the best day hikes in the Sawtooth Mountains or which whitewater rafting guide to hire, this free guide will help. 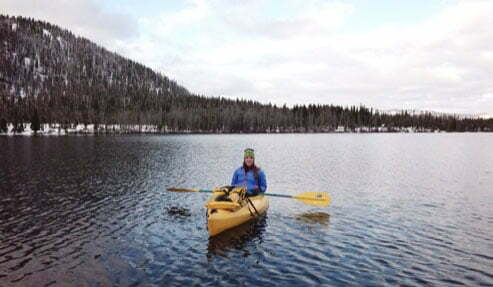 Start the gorgeous hike to Alpine Lake by taking the Redfish Trailhead Boat Shuttle. Located right on one of our other properties, the shuttle picks you up at Redfish Lake Lodge and brings you to the trailhead so you don’t have to hike all the way around the lake. On the 11-mile hike, you’ll pass by small creeks and waterfalls, scenic peaks, and mountain lakes. If you’re looking for an easy hike, try Fishhook Creek! This trail is great for all ages, so even the kids will enjoy it. Located next to the parking lot of Redfish Lake Lodge, you’ll follow the rushing creek for a 4 to 6-mile round trip. There’s nothing like being guided by the melodious sound of running water! You’ll see views of the Sawtooth peaks and gorgeous meadows. Sawtooth Lake is one of the best day hikes in the Sawtooth Mountains, but it could easily be a great overnight hike. It is rated as moderate, but will be a little more challenging with a backpack and camping gear. It’s one of the most popular trails in our area, and when you try it, you’ll see why! This hike is 10 miles round trip, and you’ll gain an elevation of 1,700 feet. Sawtooth Lake is the largest in the wilderness area, and it has incredible views everywhere you look. If you’re looking to see some of the gorgeous waterfalls our area offers, try Bridalveil Falls. This easy hike it a 7-mile round trip, and each step will grant you even more magnificent views. You will only gain 350 feet, but you’ll still be rewarded with great views of the Sawtooths. Travel through colorful meadows, tall trees, and even follow an old mining road. Once you reach the end of the trail, you’ll get to see the gorgeous Bridalveil Falls. It’s time to book your adventure of a lifetime! 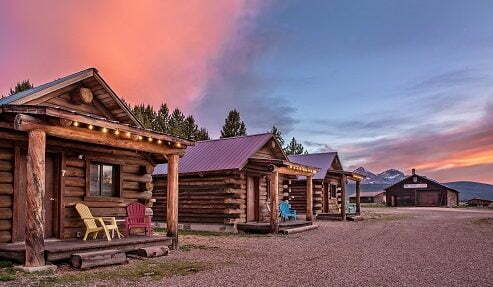 Our cozy cabins have everything you need to come and enjoy our fresh Idaho air. Take a break from the stresses of everyday life and live simply during your stay. Choose from our 10 cabins; whether you’re traveling as a couple or with the whole family, each offer something for everyone. Plus, you can’t help but love the camaraderie our 2 acres of on-site activities creates, plus its proximity to some of the best day hikes in the Sawtooth Mountains. It doesn’t get better than a serene cabin retreat in the Idaho wilderness.